Weapon modifications can sometimes seem like a big investment to take, due to some of the modifications high costs and difficulty to find. If you’re still on the fence about building modifications and need some pointers on what are the best modifications to build, you’ve come to the right place. In this article, I will be detailing what are the best modifications to build for the AK-47, as well as other guns in future articles. Keep in mind that this is just my opinion, if you have any objections or additions to my choices feel free to leave them in the comment section below. Before we get into the meat of the article, lets look at some stats first. 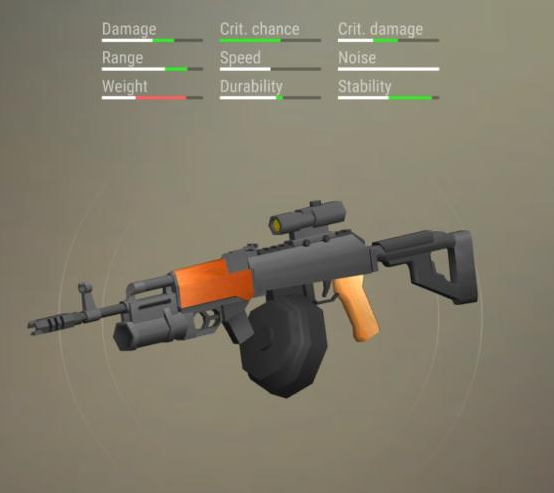 These are the stats of a unmodified AK-47, it can still hold its own against other modified guns, only being held back by its stability and non-existent critical chance. 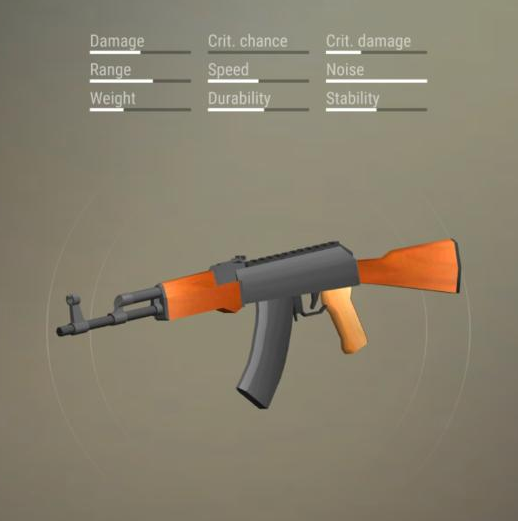 For fully automatic guns like the AK-47 you’ll want to prioritize stability, critical chance and critical damage. – Stability, so that you can shoot for longer stretches of times with a lower chance of missing shots. Missing shots will still take durability off your gun so watch out. – Critical chance and Critical damage are important too, as critical shots can go up to as high as 38 damage. You might be asking, why not just prioritize damage over everything else? Well, having high damage is nice and all, but when you’re missing more shots than you are hitting its just not worth it in the long run. When you take a quick look at the stats you might be a bit confused, as I was stressing the importance of stability in the last paragraph. But I personally feel that the deficit in stability will be made up for when you equip other modifications, so ultimately it cancels out. If there was another magazine modification that was as good as this one and didn’t have a penalty in stability I would definitely pick it, but for now we’ll have to make do with this. The increase in critical chance is also good. This is my choice for the best sight modification. It gives huge boosts to your critical chance and critical damage and gives you a boost to your range as well. The only downside is the reduction in firing speed, however I feel that the reduction is negligible. If you don’t have enough materials to build this modification, or have not gotten the blueprint yet, you might want to go for the Sight 2x mod. It gives a more immediate boost in damage but reduces the firing speed even more. This is my pick for the best muzzle modification, unless you’re going raiding, this modification is the best for all situations. It provides nice boosts in damage and stability while sacrificing durability and noise. When it comes to the best stock modifications, there’s no contest. The tactical stock is the clear winner here, providing a huge increase to stability, as well as increases to critical chance, critical damage and speed. Lastly, I recommend the grenade launcher modification to round out all the modifications for today. It provides a nice boost to damage as well as critical damage, and also has the grenade throw active skill. While the skill might only do 100 damage, which is 100 less than the actual grenade launcher weapon it is still useful for dealing with large hordes of enemies. If you’re struggling to build or find this modification, I recommend going for one of the laser modifications instead. Now look at that beauty. That’s a gun that’s ready to tear up the wastelands. As always, thank you all for reading, I hope you found this guide useful. Leave a comment below to let us know what you want covered next. See you all next time!